While I never make it the focus of my travels, if there’s an opportunity for me to visit a new UNESCO World Heritage Site, I always make sure I stop. In 1972 the UN, through the UNESCO World Heritage Committee, began recognizing important sites around the world that they consider vital in order to maintain the cultural and natural heritage we have all inherited. Even though I haven’t even scratched the surface of visiting the more than 1,000 sites in every corner of the planet, I have been to quite a few and think every traveler should make a point to visit them if they can. Some countries make it a little easier due to the width and breadth of UNESCO World heritage Sites within their borders, and Germany is home to one of the most robust collections of sites in the world. With 42 sites both cultural and natural, it’s an incredible assemblage of experiences that run the gamut of Western Civilization. While I haven’t visited all of the UNESCO World Heritage Sites in Germany, I have been to a great many and of those, these 7 are ones in particular that I think every traveler should try to visit at least once. One of my deviations from the path of Martin Luther last year was an afternoon visit to Dessau and one of Germany’s most modern UNESCO World Heritage Sites, the Bauhaus. This revolutionary school of art, architecture and design operated between 1919-1933 and included a total education in building and design. It also was arguably the most important movement of its kind in the 20th century, going on to influence architecture around the world for decades. “One has to walk around this building to grasp its corporeality and the function of its elements,” said the school’s founder and architect of the Bauhaus Building Walter Gropius. So that’s exactly what I did, many, many times this afternoon admiring it from all angles, both inside and out. What now looks like a classic example of early 20th century design, namely arts and crafts, was in its day completely and totally revolutionary. There was nothing like this before and that’s a concept that I think is hard for us to fully grasp. This wasn’t in the style of anything, it turned centuries of design on its head and in the process defined a century really. That’s incredible, that’s something to admire and ultimately, I suppose, that’s why it made its way onto that oh so important UNESCO World Heritage list. Hamburg is still celebrating the addition of its first UNESCO sites, areas of town I visited before their inclusion on this important list. I wanted to see them again though and as I thought, the buildings were just as amazing a second time. Listed as one entry, the Speicherstadt and the adjacent Kontorhaus district show off the architectural prowess of Hamburg in both the 19th and early 20th centuries. I particularly love the Speicherstadt, which seems plucked out of someone’s steampunk fantasies. Hamburg has long been an important port city, fueling the imperial ambitions of many a leader. At the heart of this commercial success was the turn of the century Warehouse District, nearly a mile long it’s the largest timber-pile founded warehouse district in the world. More than just a utilitarian storage area, the district was constructed with design and grace in mind. Small little alcoves and ornamentation can be found everywhere, an Easter egg hunt for the curious. The nearby buildings of the Kontorhaus district also reward the curious. Exemplifying the best of Art Deco design, these office buildings were created between the 1920s-40s and not only show off the beautiful design of the era, but also speak to the rapid growth of the city’s commercial side during the time period. When put together, wandering around both neighborhoods is a fun way to spend some time in Hamburg. The first stop on my Luther experience was an appropriate one, Wittenberg. 2017 was the 500th anniversary of the Reformation, making it a great time to visit what are some gorgeous cities, starting with the one that is arguably the most important in the Luther story. It was here in Wittenberg where Luther famously nailed his 95 theses to the church door, an event that sparked the Protestant Reformation. I’ve always wanted to visit for the city’s historical value, but I honestly had no idea that it’s so beautiful as well. A warm sunny day helped and the vibrant old town exploded in color, packed with folks out enjoying the weather. At the heart of Wittenberg is this, the Marktplatz. For centuries this is where the most important events in town took place, anchored by the town hall and the towers of the City Church where Martin Luther gave more than 2,000 sermons and even where the first Protestant church service took place. I’m not religious per se, but I couldn’t resist the opportunity to attend services in this remarkable building, taking advantage of a special Saturday English service. It’s a unique experience regardless of your beliefs, it’s very much living the history instead of just admiring it. It was also the perfect way to start my Luther adventure. Most tourists to Berlin will end up on Museum Island at some point thanks to the incredible museums (shocking) found there. The world famous Pergamon may be the most well known, but there are four other museum complexes there covering everything from ancient archeology and history to priceless works of art. Better than what’s inside the museums though, I loved being outside, especially on a warm spring day. The bright green lawn in front of the Neues Museum is perfect to relax on, bring a light picnic and just people watch. And believe me, if there’s any city worthy of spending hours people watching it’s Berlin. Maybe it was the bright sunshiny day, or maybe it was the city’s famous smoked beer, but whatever did it, I totally and completely fell in love with Bamberg. It probably sounds repetitive, but Bamberg too has an ancient history, and it too is recognized by UNESCO for its beauty and incredibly intact medieval old town. It’s also so colorful, much more so than I would have thought and with picture-perfect views along the river it was an afternoon I know I’ll never forget. The city’s Christmas markets of course only add to this festive feeling, from smaller ones around town to the massive central Christmas market in Maximiliansplatz. Located in the Hessian city of Kassel, the Bergpark Wilhelmshöhe is definitely not your average UNESCO World Heritage Site. Built in the 17th century by regional nobility, it’s essentially the biggest water fountain you’ll ever see. Descending a long hill, reservoirs and channels supply water to a complex system that supplies the site’s many grottoes, fountains and a 350-meter long Grand Cascade. Sadly, no water was running when I visited but I’m told it’s a spectacle to see in person. Plus it’s in Kassel, a fascinating city in its own right and home to the new Brothers Grimm Museum. A lot of attention is paid to the many cultural wonders in Germany, which are indeed amazing. But so many first-time visitors are, I think, surprised by how many outdoorsy experiences the country has to offer as well. While driving through the German countryside, I unwittingly passed through this UNESCO World Heritage Site and since I knew I’d probably never be back, I had to stop. These particular forests aren’t unique to Germany, they can also be found in several other places around central and eastern Europe, but they’re important because they represent what most of Europe once looked like. These incredible forests truly were the first inhabitants of the continent, and to explore them on a day hike isn’t just fun and romantic, it’s one of the best outdoors experiences you’ll enjoy anywhere in the country. 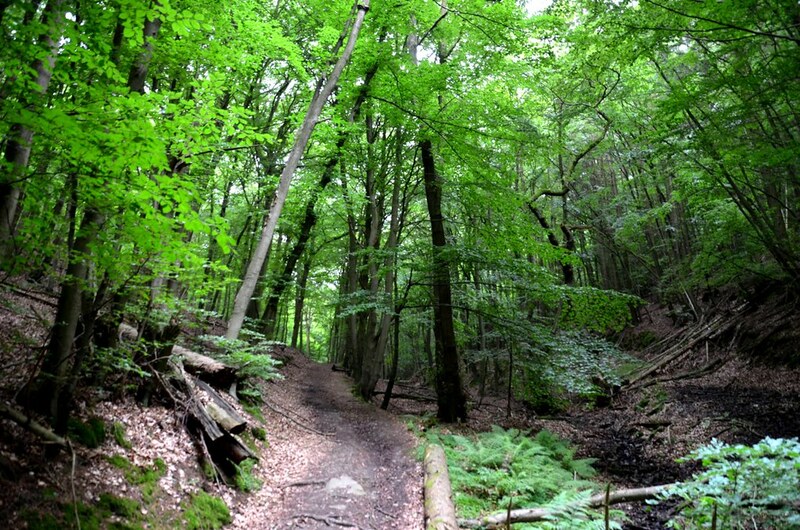 I found myself in the Kellerwald-Edersee National Park in Hessen, which marks the natural border of the beech forests. Bizarre forest formations and mysterious, gnarled trees are what I encountered and while my stop was brief, it was one of those unexpected moments I know I’ll remember for years to come. Germany is not only famous for its cars but it is also very well known for its heritage. I love this article and thankful to you for writing. I hope you would share these types articles in upcoming days.